Wingert Grebing Brubaker & Juskie LLP is proud to announce Ian R. Friedman has been elevated to a partner. Friedman’s diverse practice area includes professional liability defense, business litigation and defense and prosecution of personal injury cases. He was previously named the 2016 Young Attorney of the Year by San Diego Defense Lawyers and has been designated a Southern California Super Lawyers® Rising Star since 2017. Friedman joined Wingert Grebing as an associate in 2013 after graduating from the University of San Diego School of Law. Greco Traficante Schulz & Brick is pleased to announce Michael E. Rogaski as the firm’s new Partner. Mr. Rogaski brings over 20 years of experience and leadership in handling complex litigation matters. He is a University of California, Davis, graduate and obtained his Juris Doctorate from McGeorge School of Law where he graduated with distinction and as a member of the Traynor Academic Society. The members of the firm are excited to have Mr. Rogaski on their team and are proud of his accomplishments. The law firm of Schwartz Semerdjian Cauley & Moot (SSCM) is pleased to announce that it has acquired Small & Schena LLP, and that attorneys William F. Small and John A. Schena joined the firm as partners. With a focus on business litigation, employment law, intellectual property and related practice areas, Small and Schena will add nearly two decades of combined litigation experience in state and federal courts throughout California to SSCM’s extensive roster of expertise. 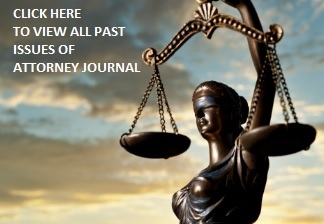 SSCM will continue its extensive practice in civil trial and appellate practice in state and federal courts, with an emphasis in business and commercial litigation, employment litigation and labor counseling, construction litigation, personal injury, wrongful death, product liability, officers and directors liability, professional liability, insurance defense, intellectual property, including trademark and copyright, and unfair competition litigation. Gomez Trial Attorneys Partner Bibi Fell has been named as one of the three finalists for the Consumer Attorneys of San Diego’s Trial Lawyer of the Year. The winner will be announced at its 60th annual awards and installation dinner on February 22. Crosbie Gliner Schiffman Southard & Swanson LLP (CGS3), announces the addition of Sean Gaffney as senior counsel. Previously with Procopio, Cory, Hargreaves & Savitch LLP, Gaffney joins CGS3’s growing real estate litigation group and will be based in the firm’s San Diego offices. With nearly 20 years of litigation experience, Gaffney has represented both plaintiffs and defendants in all phases of trial work and alternative dispute resolution relating to California real estate law, including claims arising from failed real estate transactions and development projects; landlord/tenant disputes; corporate, partnership and LLC governance disputes; easements/adverse possession claims; construction and property management insurance coverage disputes; fraud/warranty claims arising from residential real estate transactions; construction defect and delay claims; and eminent domain and public/government construction claims. Finch, Thornton & Baird, LLP has added four attorneys to its growing legal team. Lindsey C. Herzik has been practicing since 2015, focusing on business disputes and litigation, construction law, federal civil procedure, and antitrust and shareholder litigation. Melissa H. Rose practices in diverse areas of construction law including claims and disputes, collections, insurance defense, both private and public works litigation, and labor and employment. Thomas E. Diamond practices in areas of construction law including claims and disputes, collections, as well as general business and commercial litigation. Cory P. DiBene practices in the areas of construction law including contractor and subcontractor disputes, federal procurement and claims, and commercial real estate. In addition, Adam C. Witt was named Partner effective January 1, 2019. Witt focuses principally on serving the broad-based transactional needs of business owners and executives, contractors and developers, tenants and landlords, and buyers and sellers of real property. His practice includes the drafting and review of a broad range of contracts; advising on real estate transactions; construction and general business dispute negotiation and litigation; and guidance on business formation, operation, and governance. Clients include real estate developers, general contractors, subcontractors, and a rich mix of both large and small business owners, investors, and lenders.